Boston Red Sox's Brock Holt celebrates with Tzu-Wei Lin after hitting a three-run home run during a game against the Toronto Blue Jays, at Fenway Park, in Boston, Ma., on Sept. 11, 2018. 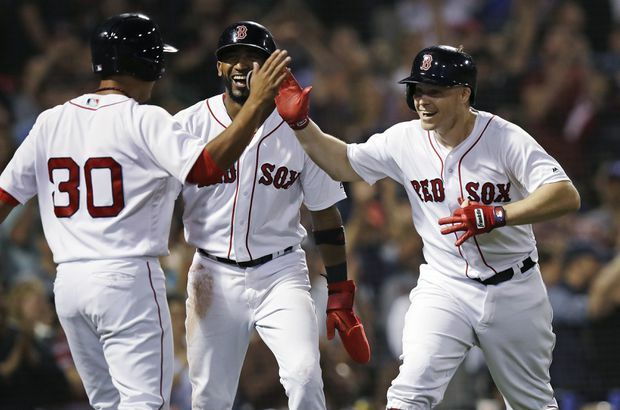 The Boston Red Sox became the first team in the majors to clinch a playoff spot this season, rallying on pinch-hitter Brock Holt’s go-ahead home run in the seventh inning to beat the Toronto Blue Jays 7-2 Tuesday night. Guided by rookie manager Alex Cora, the Red Sox improved the best record in baseball at 99-46. They assured themselves at least a spot in the AL wild-card game while reaching the post-season for the third straight year. Sale continued tossing in the bullpen after he was pulled, trying to rebuild his arm strength for the post-season. The Red Sox matched a team record by making it to the post-season three years in a row. They also did it from 2003-05 and 2007-09 – with World Series titles in ‘04 and ‘07 included in each run. Ryan Brasier (2-0) got the win with 1 1-3 innings of hitless relief as Boston used seven relievers after limiting Sale in his return. Pillar ran face-first into the centre field wall chasing Pearce’s triple. Pillar needed a few minutes to get back to his feet, but stayed in the game. Red Sox: Sale made his first start since Aug. 12 and threw 26 pitches. After a leadoff double by Gurriel, he struck out two, then walked a batter before Grichuck popped out to end the inning.